ID Tech MiniMag - Track 2, USB interface. Includes USB cable. Color: black. The MiniMag Intelligent Swipe Reader is designed for POS and desktop applications where space is at a premium. The MiniMag swipe reader is designed for POS and desktop applications where space is at a premium. The entire unit is just 90 mm long (about the length of a standard credit card), giving it the smallest footprint of any unit with comparable features. It reads up to three tracks of information with a single swipe in either direction, and has both beeper and LED indicators to signal a successful read. The unit can be programmed to divide, rearrange, edit and validate fields of entered data. 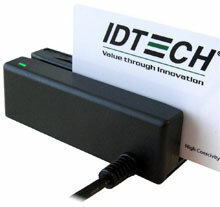 TTL, RS-232, Keyboard wedge, and USB interfaces are available. The ID Tech IDT3331-02UB is also known as IDTech	IDT-3331-02UB	or IDT333102UB	.